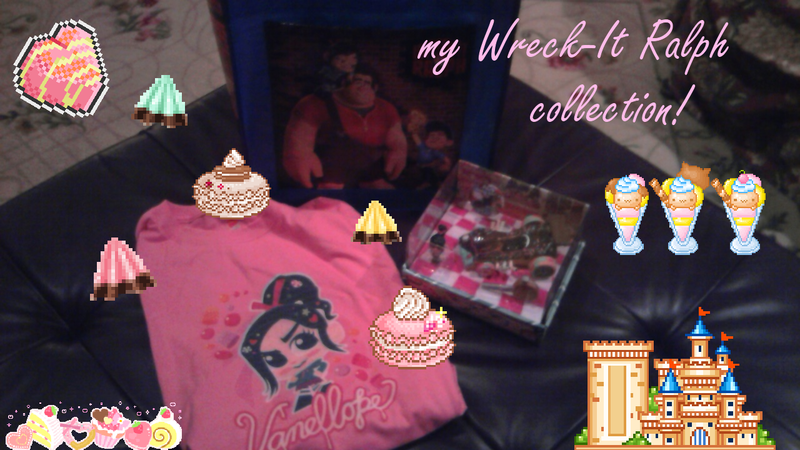 Pizza-Kei Cute: my Wreck-It Ralph collection! hello everyone! a few of my friends on twitter said i should do a blog post about my wreck-it ralph collection. 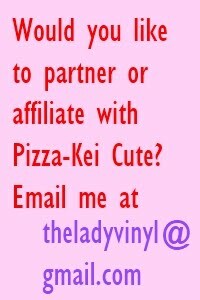 it's really small right now and i hope to get more cute stuff for it in the future as availability of it grows. i got all these items for christmas and the movie had only been out for under a couple months at the time, so there wasn't a lot of merchandise available. i got all these from the small section for WIR on the disney website with rewards points my grandma gave me for christmas (which means it was free for both of us, yay)! i've talked about how much i love this movie and recommended it to lolitas as well as picked the DVD as one of my favorite march items, so you know i love this movie. it is seriously one of my favorite films, so naturally, i had to start a collection of memorabilia! i love my vanellope shirt the most! 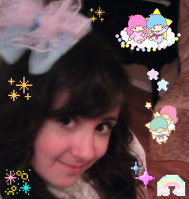 i used it in a fairy-kei outfit before, though i haven't worn that outfit yet because of cold weather. i love how the print looks like she's a felt cutout, the melty letters, and the art style! 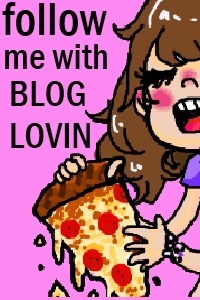 it's all so cute and perfect. the disney site has all the sugar rush characters as "racer" figurines, which is a set with a small figure of the character and a car of theirs you launch using a key shaped like the coins from sugar rush. 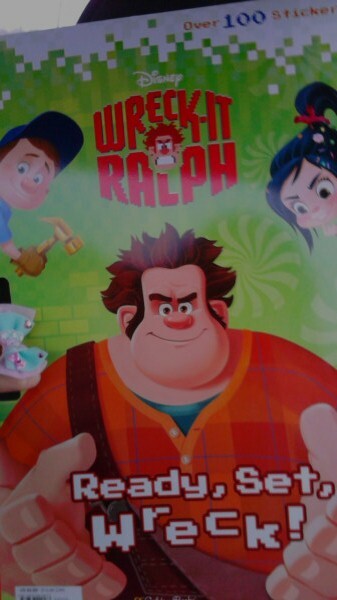 they have all the sugar rush characters, even king candy! they were $9 each when i got them, but it seems like they're on sale now for only $6. 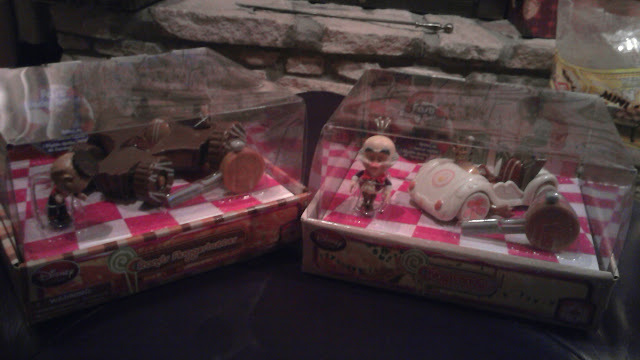 the quality is pretty good, so i would definitely take the chance to get your favorite character! 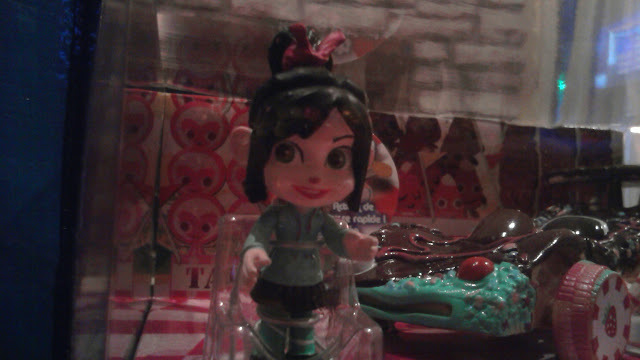 not the best or most detailed paint job on vanellope, but she is still very cute. i think they put all the budget of the paint job unto the cars, because wow!! 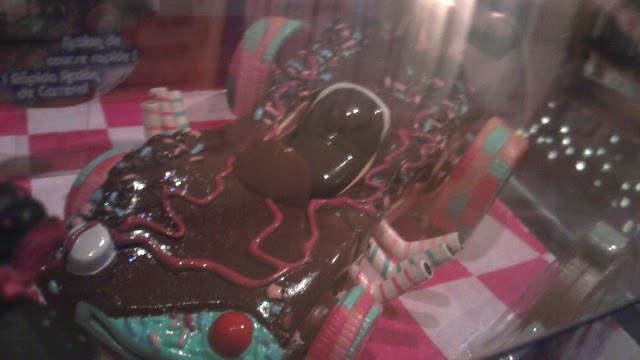 it looks just like her car, sprinkles, glitter, and all. it's just like hers. the only thing different was that it wasn't signed by her and ralph, but i think that would be too small to be legible on a little toy like this. 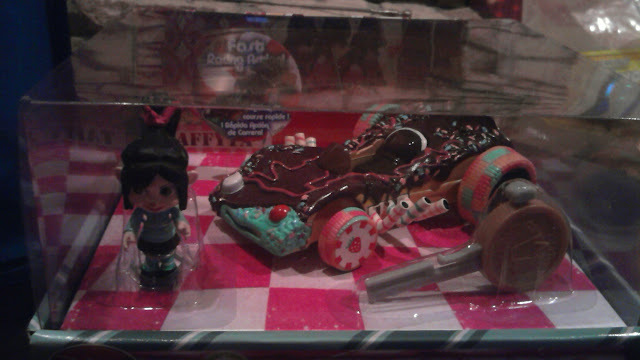 i haven't opened it because the packaging is so cute. i'm in a terrible internal turmoil about it. these wreck-it ralph totes are pretty simple and nice! they have one side with this design, another side that is blue with a pocket (the side pictured). and what's so cool is when you fill up the bag and you can see the profile of the bag has pixel art of ralph on it! i got this HUGE coloring book at kmart! it's not huge in terms of pages, but length and width. it's a big book. 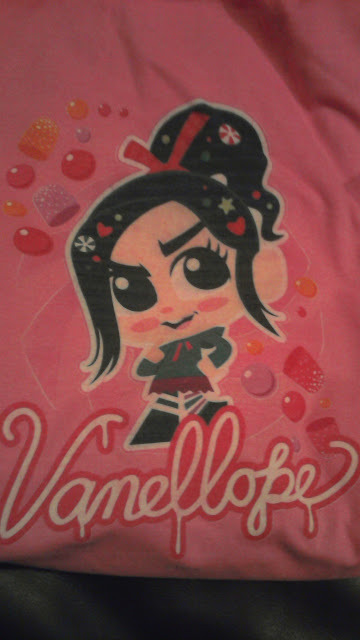 it came with tons of stickers in the front either in pixel art style or the same style as my vanellope t-shirt! 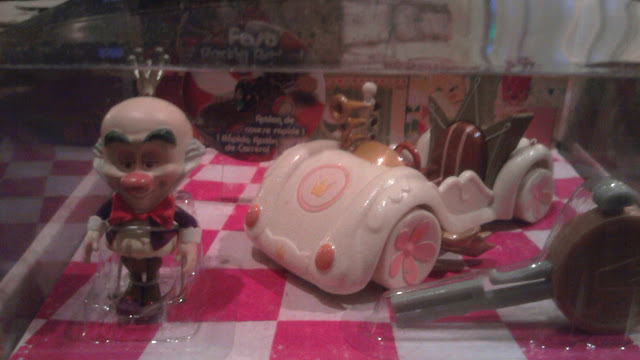 my brother also got a lot of WIR stuff for christmas, so i took pictures of some of his collection! 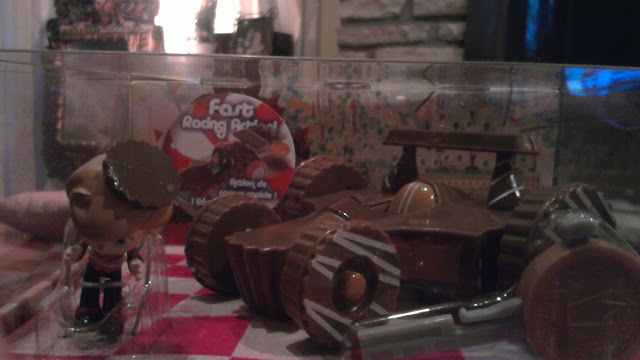 he has the racers of king candy and rancis flutterbugger! he got these really cute t-shirts, too. i love the one on the left so much! it was customizable, but we liked the default saying. 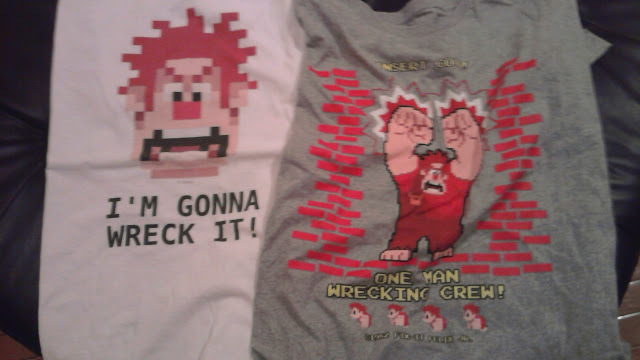 the right shirt is so cool because it has a fake fix-it felix copyright for 1982 and the little sprite of ralph from when he's leaving pac-man at the beginning of the movie. 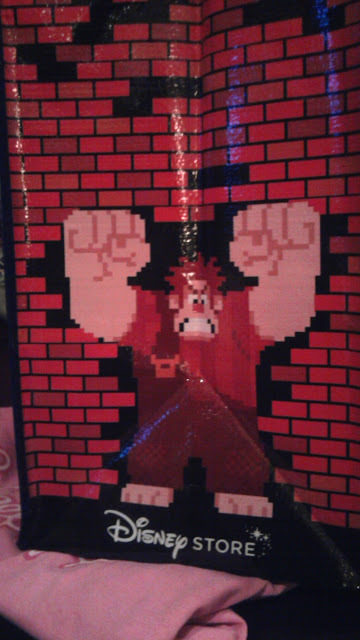 he also has a really nice binder and some nicelanders figurines, but i didn't get photos of those. 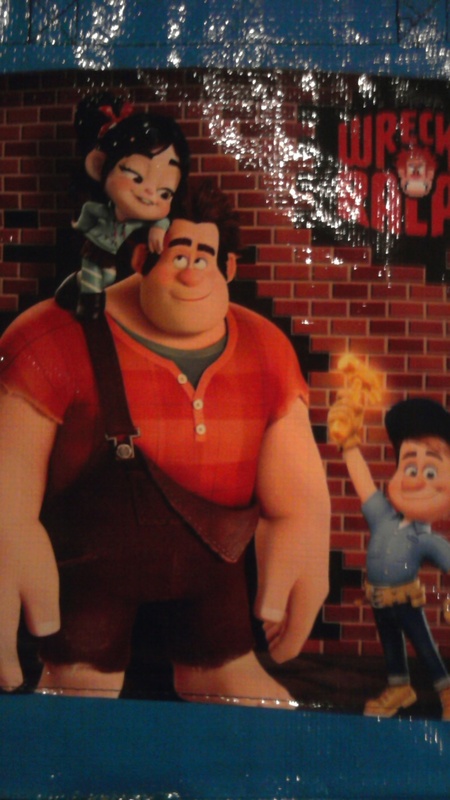 hope you guys liked seeing our wreck-it ralph collections!